Toronto-based personal investment tracking tools firm Vuru Inc. has been acquired by free online service Wave Accounting. In an acquisition deal in which the terms were not announced, Wave Accounting says that Vuru co-founders Yoseph West and Cameron Howieson will become the newest employees of the 80-person firm, also based in Toronto. The deal sees Vuru’s suite of personal finance tools with about 35,000 users added to Wave’s free Web-based accounting and payroll services for small to mid-sized businesses. The Vuru team has known the Wave Accounting co-founders for almost a year, West tells ITBusiness.ca. After launching its product last October, the firm was considering its options and decided that joining Wave’s team would be a strong fit. 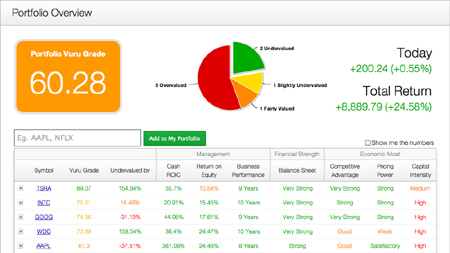 Vuru helps investors make sense of complicated financial statements. West’s new role will be to head up Wave’s personal finance division alongside his partner, Howieson. Vuru’s current customers can expect more muscle behind the online tools, which help make sense of complicated financial statements and stock data. Vuru was an attractivie target for Wave in terms of both talent andtechnology, said James Lochrie, Wave’s co-founder and chief productofficer. “We felt the two founders would be a really, really great fit for ourteam. They were great product development people and have similar viewsto Wave’s in the online space around financial information. And (Vuru)is beautifully designed and very easy to use for the non-techiepopulation,” Lochrie said. Vuru will keep its products separate from Wave Accounting for now, and continue to operate. But Wave will be working on the best ways to integrate Vuru into its business and product platform over the nextsix to 12 months, Lochrie added. Although Vuru’s technology trackspersonal investments and Wave helps track business transactions forsmall enterprises, Lochrie said there’s a demand from SMB owners to beable to access both sides of their finances in an integrated way. “The delineation between personal and business finances is not as clear(with SMB owners) as it would be in a more significant enterprise,” Lochrie said, echoing West’s comments on the symmetries within the deal. Wave users can already track their personal finances, but the Vuruplatform will greatly enhance that capability, he said. Will there be more acquisitions in Wave’s future, especially since thecompany has secured $19 million in venture capital financing in lessthan two years? Vuru’s West credits a stint with Montreal accelerator Founder Fuel for getting his firm to today’s acquisition announcement. Before entering the program, Vuru had just 1,000 users and was growing slowly. After graduating, it was up to 6,000 users and had been featured in the Globe and Mail. “Without help and guidance and having them show us the way to grow our business, this deal wouldn’t have happened,” he says.